In Kontent Machine 3, we integrated our proprietary content quality checking algorithm. We have included three predefined sets and three slots for setting your preferences. This is Kontent Machine’s rating system of content readability. – Excellent refers to high-quality pieces of content. – Good means that the content is still readable, but the filters are not that strict as they are with Excellent. – Questionable is neither good nor too much of a mess. It could hardly pass human moderation. – Poor is for content that you need for indexing purposes and higher tiers only. – It’s a Mess – no filtering at all, and anything can come through. You can tell Kontent Machine to attempt and raise the quality of the content. To save time, it will do that once then check the quality score again. If it still doesn’t meet your criteria, it will skip it and move on. Very Important: This determines the quality of the input, NOT the output. If you select Excellent only articles with Excellent quality will be chosen for your campaign BEFORE any spinning is applied. If you want Excellent quality, High spinning quality and you are using a very good, spinner you can be sure that the OUTPUT will be excellent too. There is no point in working with Good quality articles and then apply sentence spinning + Low spinning quality. 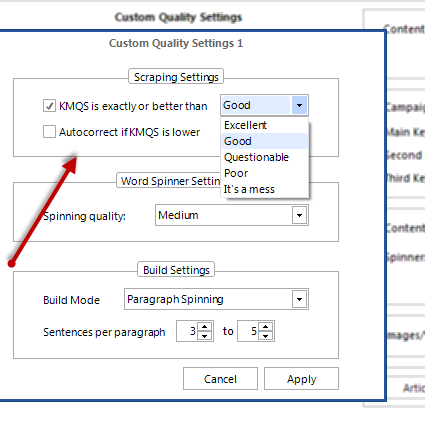 Build Mode refers to the type of additional spinning applied – paragraph or sentence level spinning.